I just opened up my issue of TV Guide Magazine to find some exciting OFFICE scoop and it involves my favorite TV twosome – Jim & Pam…and the extended Halpert family. To date we’ve learned bits and pieces about the families of many of he Dunder Mifflinites, but until now very little was know about Jim Halpert’s family. There was mention of a Larisa Halpert, first thought to be his mother and then later his sister. And in last season’s “Branch Wars” there was a confirmation that Jim was indeed an uncle to his brother’s baby. But later this season we’re going to be learning a lot more about The Halperts and meeting Jim’s brothers. According to TV Guide: “THE OFFICE’s Pam Beesly is about to meet her likely future brothers-in-law. In a late October episode of the NBC comedy, Pam – still studying art in New York City – arranges a Big Apple reunion with boyfriend Jim and his look-alike brothers, played by actors Blake Robbins and Tug Coker. Ok so, so much to discuss here. – Pam is still in NYC at the end of October? Oh no! I thought she would have been back by then. That’s a long time away. – Why does Pam need to show Jim she’s so committed to the relationship? Does something happen that makes him think she’s not? Uh oh. – Meeting the Halpert’s goes horribly wrong? Oh Pam…say it ain’t so. How could the Halperts not love little Pam Beesly. Wonder if there’s a little left over issues with Pam breaking Jim’s poor little heart into a million pieces. – Look alikes? I dont think so. 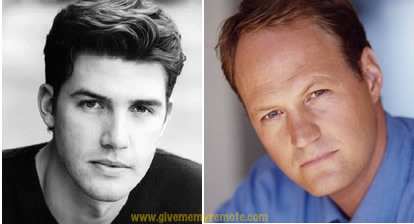 Perhaps there is a bit of resemblence between John Krasinski and Tug Coker, but I’m not seeing any with Blake Robbins. Hmmm, wonder if these two guys are based a little on John Krasinski’s own older brothers . My two cents: Jim has known Pam’s every move day in and day out for the last several years because they work together. When she goes off to art school, he loses that connection with her and becomes insecure, especially since she’s loving NYC so much. Things get a bit rocky while trying to make the long-distance thing work, and she needs to show Jim she’s still in it 100%. Thus, she calls in the brothers. On a separate but related note, I’m excited for this season of The Office, but nervous as well. I don’t want to see Jim and Pam angst again. There was enough of that in Season 3. I don’t know if I can handle the ups and downs the writers keep referring to. Ugh! If Pam breaks Jim’s heart I will cry. I tried avoiding office spoilers as much as possible, but i finally gave in. I’m thankful isn’t too detailed. As far as it being october, maybe the office time line and the real world time line aren’t going to match up exactly. Maybe this season picks up not so long after “Goodbye, Toby” instead of the traditional model from the past 4 seasons of skipping over what happened in the summer. That would sort of bring back a storyline that had a lot of juice in the first three seasons–the will they, won’t they between jim and pam. I wouldn’t worry about it going “horribly wrong”. Its always weird and awkward meeting girlfriend/boyfriend’s family for the first time. I’m sure in classic office style they just turn up the awkwardness a few notches to give us some uncomfortable/funny moments. I think it would be cruel and unusual at this point to have this relationship go south. JAM isn’t even my favorite part of the office, but i’ll admit its become a big part of the draw for me. There are very few shows in my life where i’ve grown to really care about what happens to the characters. This is one of them. So what i’m trying to say is–don’t screw this up Greg Daniels and company. I have faith though. Oh, my nervousness just turned up to 11. There’s also an interview online with JKras (linked over at Office Tally) where he talks about some some tensions in the relationship and about the proposal. Everything I’m hearing and reading makes sense and is so realistic when you’re in a long-distance relationship, but angst makes me skittish. BUT I’ll try to be positive and say that the tension will just have to lead to something extra sweet and romantic. Right? RIGHT?? Okay…WOW!!! This Season is going to be the best yet! I agree that Pam not coming back until October is way unfair, and Pam thinking that she HAS to impress the Halpert brother is totally untrue in my opinion. Who wouldn’t like her? I can see the… “family” resemblance with those actors. I would totally think they were family. Didn’t see the proposal at the half way point between NYC and Dunder Mifflin coming. Nice work writers. Yeah, Tug Coker for sure looks like a brother, and Blake Robbins could pass, but I’m sure being the best actor auditioning for it helped Blake Robbins. I couldn’t place him, but then I checked him out on imdb.com and remembered him from Oz. This guy has got serious acting chops, and I guess he does comedy too. I’m expecting a three episode wedding with the brothers involved. Blake Robbins was great, hope they bring him back. He was such a badass on OZ, funny to see him play such a wiseass here.